Unfortunately recent family committments, and the usual mad rush towards Christmas have meant little time for working on the layout. However I have started cutting some track, I have also cut holes in the baseboard for the point motor operating rods and the uncoupling magnets, and I have stuck down a layer of cork, so I am now ready to start laying the track. With any luck I will get this done over Christmas and so should have an update with photo's in the new year! Well, they do say that imitation is the sincerest form of flattery, so I am flattered ... ! A Happy Christmas to all, and I promise a full update in the New Year! 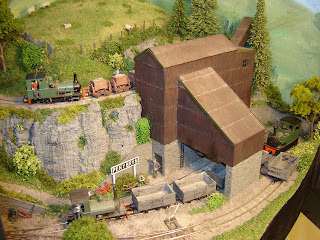 On Saturday I was at "EXPO-NG", the biggest narrow-gauge model railway exhibition in the UK. As usual there was an excellent selection of layouts in a range of scales and gauges. In addition there is good trade support from the specialist suppliers to narrow gauge modellers, so it is an ideal oppotunity to see the products of traders you rarely see at other shows. I know there are probably one or two I missed, also there was a "Pizza Layout" competition which I did photograph but they didn't come out to well, expect to see them on http://carendt.com/ shortly! I was helping out on the 009 society stand (well part of the day anyway), and managed to put together a few couplings and a wagon kit. One of the best things about shows like this is meeting people you only ever see at these shows! Still not much progress on the layout, however on a recent family holiday to Devon I managed to slip in a trip to Pecorama. If you are ever in the area it is well worth a visit, great for families of all ages as well as model railway enthusiasts. Needless to say I spent some time and money browsing the shop and I now have all the track I need (I had some point salvaged from a previous layout but not enough). I also bought some card kits from Metcalf Models I intend to use for the factory, and low-relief houses for the back of the layout. As an aside, I noticed the other day my 10-month old boy was playing with a micro-model railway layout. 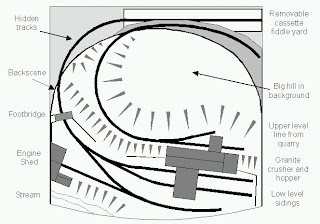 Indeed, it is what is often called a "Pizza" layout, featuring a circular track plan. 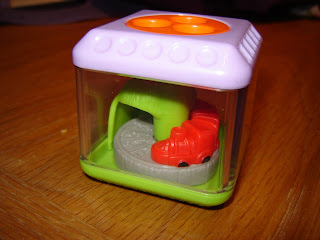 It came with his Fisher-Price Peekaboo block train. It features a tunnel and train with 2-2-0 loco and 2 wagons, it even has digital control - that's right, you put your finger in a hole in the top of the block and spin it round! Is this the smallest micro-layout? So at last I have something concrete - well, wood - to report. I have largely completed the baseboard for the new layout. It is made from 6mm Ply, with some 6mm MDF (the backscene) as this is tougher than Ply. Cross-supports and bracing is using 2" by 1" softwood. The main board incorporates ends, side "wings" and a lighting pelmet to frame the scene. 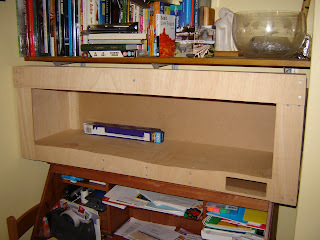 The photo below shows the board in place on top of the bureau and below the shelves in the alcove mentioned before. I have yet to make a slide-out shelf for it to sit on, which will allow it to slide forward and allow the fiddle-yard (not shown) to slot onto the end. The hole bottom right will house the control panel. The blue box is one of the light fittings I will fit under the pelmet. The visible parts of the board are all Ply, which I will stain to fit in with the other furniture. The photo below shows some of the tramway-style stock I will run on the layout. 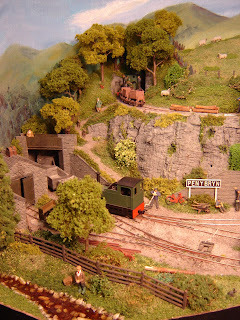 From right there is a Glyn Valley tram loco, a "Toby" style wooden bodied tram loco, and a Sharp-Stewart loco with tramskirts. The latter two are Paul Windle models. At the back are a couple of Eggerbahn coaches that fit the tramway theme well. 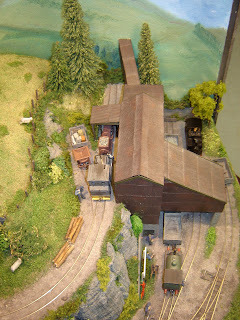 I have been fitting all my stock with Micro-trains N-gauge buckeye couplers (like Kadee's). I still have a lot to do though! However the next task on the layout is to lay some track! Southon Yard has been sitting on the bureau, in the alcove next to the fireplace in our dining room for the last 3 years. This has been great as I can play trains at any time, and it is good to show off my loco's. However it struck me that it wasn't fully utilising the space there, and the limitation of Southon Yard is that you can't really run trains, just move loco's about. So I decided to build a layout to fill the alcove, which gave me 3 foot 6 inches by about 13 inches deep, but also restricted to 12 inches tall at the backscene due to shelves above. I seem to have collected some tramway style loco's, with skirts fitted, and also some coaches that would look good on a tramway style layout, but how do you capture the feel of a roadside tramway in such a small space? I also wanted good shunting potential. I thought a train length of 12 inches, plus loco (up to about 4 inches) was sufficient. That means 2 bogie coaches plus brake van, or 3 4-wheel coaches, or about 5 wagons. So I came up with this plan, you may recognise elements from Wantage - particularly in the Station with overall roof and the goods shed behind. I also have a goods yard, and a factory, so 4 sidings to shunt. I even got an engine shed in! Low relief buildings and the factory will give an urban back-streets feel. The line runs onto a removable "fiddle Yard" which will use the cassette system I designed for Pen-Y-Bryn Quarry, as that worked well. The fiddle yard will sit over the mantle piece, but will only be fitted when the layout is slid forward about 6 inches, so I plan to mount the layout on drawer runners into the alcove! I have started building the baseboard - but more of that later. However I have not come up with a name for the layout yet, so suggestions gratefully received! This layout was built for the “Cubic Challenge” – a maximum dimension of 500mm cube - at the 2005 EXPO-NG. The scale is 009 narrow gauge. It depicts a granite quarry in mid Wales. In the foreground are the sidings where wagons are filled with granite under the large corrugated iron structure, before departing to the “main line” past the engine shed and under the bridge to the left. On the upper level a short train of skips runs back and forth with stone from the quarry workings the other side of the hill. The design of the layout makes good use of depth and height to create the scene of the railway in the countryside, whilst providing operational interest. The fiddle yard uses a cassette system to minimise space. The layout is constructed using Foam-core board, which is quick and easy to use and lightweight. This is a first for me. The wagons used on the upper level have a novel design with a reversable skip, which has a full "load" on the underside of an empty skip. Thus as the "full" wagons are pushed through the unloading shed a piece of wire rotates the skip to show the empty skip. The wagons on the lower level are loaded with real granite via a chute which (disguised as a covered conveyor) comes out the side of the layout. Like Southon Yard, I re-used buildings originally built for a previous layout that was never completed. That layout was called Pen-Y-Bryn, so this became Pen-Y-Bryn Quarry. Southon Yard is the motive power depot of one of the Welsh narrow-gauge lines. 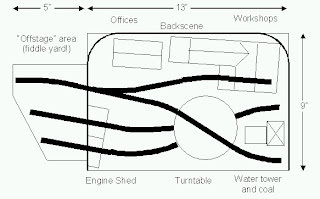 The yard features a 25-foot turntable, a two-road engine shed, and a workshop for maintaining the line’s engines and rolling stock. Locos enter and leave the yard via the line behind the engine shed, they are turned if required, coaled and watered. You may also see shunting of coal wagons and supplies to the works. The turntable may seem unusual on a line such as this, but the Ffestiniog and the Lynton and Barnstable lines had similar ones, as did tramways such as the Glyn Valley, as the locos usually ran cab-first on tramways. In fact, this line has some tram engines so it may have been originally built as a tramway. The layout was designed and built to fit into a shoebox for a competition at EXPO-NG in 2004, although I do have large feet which helped! The lighting and back-scene remove for this, as was allowed in the competition rules. It was also designed to be a setting for displaying my growing collection of 009 locos, and can be placed on a shelf. The design and construction of the layout had to be carefully thought out because it is so small. The turntable is motorised through a set of gears and shafts, the motor is in the workshop! It was great fun to build this layout for the competition, even though it was designed and built within a tight 5-month timescale! I managed to use some buildings from a previousl layout that was never completed, but even so there was a surprising ammount of work for such a small layout. The icing on the cake was that I won the competition! Well this is the first time I have ever done a "Blog" so let's see how it goes!